There are two types of printed marketing pieces. There are those that instantly feel like you've already read them before, and there are those that instantly feel like they're something different. Something special. The key to getting that latter effect is by choosing the right luxury printing paper. Here's how. Each type of paper is used for different projects, and can have a big impact on whether it fits in with the tone of your brand or not. Here are the features each luxury printing paper brings to the table. If you're looking to create a more deluxe brochure for premium products, then Constellation Snow is a stock which can have its benefits. This paper comes in an extra-high, white uncoated paper and card, with embossed linen for added effect. The paper provides a textured effect which is an important factor when readers can turn into potential customers. As the readers will be touching and holding your product and flicking through the high-quality pages, they will instantly know a lot of effort has gone into this. You'll find that not many business use Constellation Snow as an everyday printing paper, as this is seen as a more high-end material that can't be used for just anything. What it's best used for: This paper reflects on the type of business utilising it, so it could be a fine dining institute which is extremely difficult to book, or a similar service like a hotel which is in high demand. If you're chasing a classic, older vibe, then the Lux material is one which benefits the more classic products. Examples of this include older cars, watches and even hotels. This paper is an ultra-thick, triple-layered card which features a signature coloured core running through the centre layer. The surface of this stock comes uncoated, so a printing technique like LED UV can be the best way to use this paper to its potential as you're able to experience the true texture of the paper while enjoying the understated, classic appearance. What it's best for: As Lux gives off a classic feel, the characteristics it provides can be good for brochures that showcase premium timepieces, cars, jewellery and venues - and can even act as an in-depth lookbook to highlight the fine details of the images and the content. Silk paper provides a soft feel which can be considered as a fabric, as opposed to traditional paper. The paper is made of silk fibres that are bound together to create a lustrous paper which can be used effectively in numerous projects that are advertising premium products and services. Providing a little extra strength compared to other paper, silk can also be combined with other fibres to produce something incredibly appealing with a crisp finish. Once silk has been printed on, it produces a coating which fits somewhere between a matte and gloss finish. The colours used consistently remain vibrant which help highlight all of the small details by reducing the shininess and increasing the readability. Think of it like choosing an eggshell paint for your woodwork at home, instead of a high-sheen gloss. Depending on the type of print technique used, there's a risk of inks and paints bleeding onto the paper, but that worry can be eliminated with a technique like LED UV, which uses UV curing to produce perfect results. What it's best used for: The glossy effect that silk provides is often seen in magazines because it maintains the readability. Silk is also used for more luxury brochures rather than usual paper which makes the brochures more attractive, as small pieces of silk can be used to add a highlight or accent to a project. Uncoated paper might not always feel as smooth as coated paper, but because it's available in a wider variety of textures and finishes, it's a lot more versatile. Uncoated papers have no added layer on the surface, which results in a more natural look and feel. Another useful advantage of using an uncoated stock is that it offers a greater variety of options, ranging from a wide range of colours, visual effects and even different scents to stand out further. One of the reasons why uncoated stock has increased in popularity is because of the recent organic trend, which helps give off a more natural quality look and feel which resonates with readers. 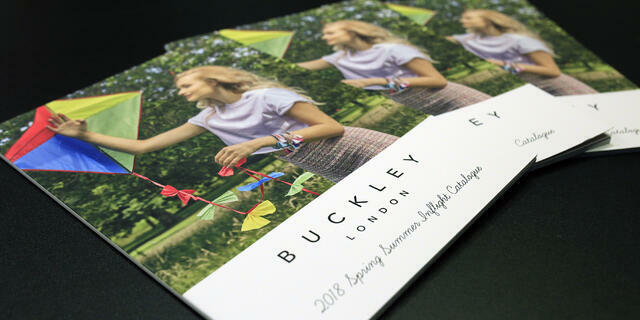 A Buckley London brochure. A simplistic, sleek design showing how vibrant the colours look once printed. In general, uncoated paper has a soft finish and tactile quality which feels nice in the readers' hands and because it's more absorbent than coated paper, the ink appears much flatter on this modern choice. As the feel of this paper is superior to others, it can often convey feelings of prestige and wealth that other printing papers lack. What it's best used for: As uncoated paper is a versatile material, it can be used in a wide range of products to make them luxurious. 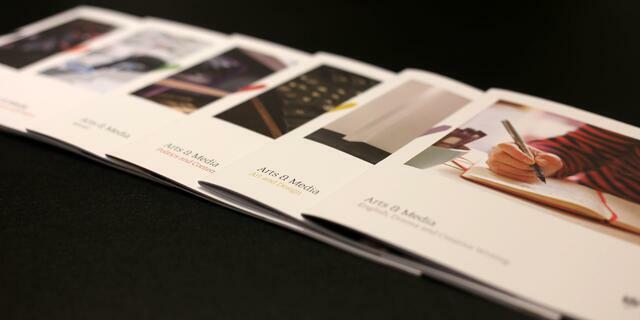 Luxury brochures greatly benefit from uncoated paper, especially when it's been printed via an LED UV printer. Combining these two aspects results in a much sharper and more defined finish which features more vivid colours to make even the finest of details in the luxury brochure stand out. Versatile paper needs a versatile printer that can consistently print to perfection on any material. 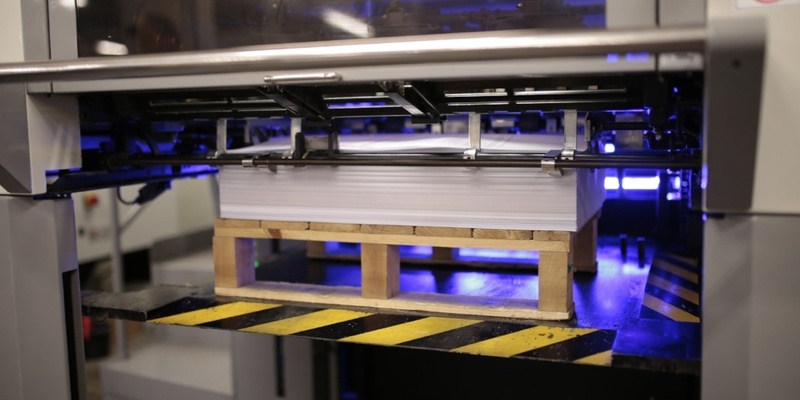 A solution to consider is LED UV printing, which has brilliant features that can make the most out of stock where other printers could fall short, such as digital printing. LED UV printing uses UV Curing, a drying method which helps separate ordinary brochures from luxury, high-end brochures. Just like what you're looking to create. This method uses light instead of heat and air during the curing process. It dries inks and coatings in a matter of seconds thanks to a UV induced chemical reaction. This dramatically improves the physical properties of the luxury papers. It's much more difficult to cause damage with scratches, no chemical spillage can have an effect, while it won't lose its shape either when opened. So, all of the unique characteristics remain. Plus, the beauty of the LED UV curing process is that it dries the coatings so fast that there is never any bleeding or seepage into the stock. This results in consistently sharper and crisper finishes. Finding the right way to produce a high-quality brochure to show off your luxury product all starts with the type of luxury paper you'll be using. But there is more to it than that. Don't make the mistake of not considering every aspect of your luxury brochure, as one oversight can leave you chasing your competition. Think about the stock, printing techniques, how to photograph your products, designing the perfect layout and so much more. Make your brochure a success by downloading your guide today, and it's completely FREE.